‘The Bung Frankenstein’ (The Lepracaun, 1908) | Come Here To Me! This cartoon is taken from a 1908 edition of The Lepracaun, a satirical magazine founded by the cartoonist Thomas Fitzpatrick in 1905. A monthly publication, it featured some biting satire and James Joyce was among its contributors. 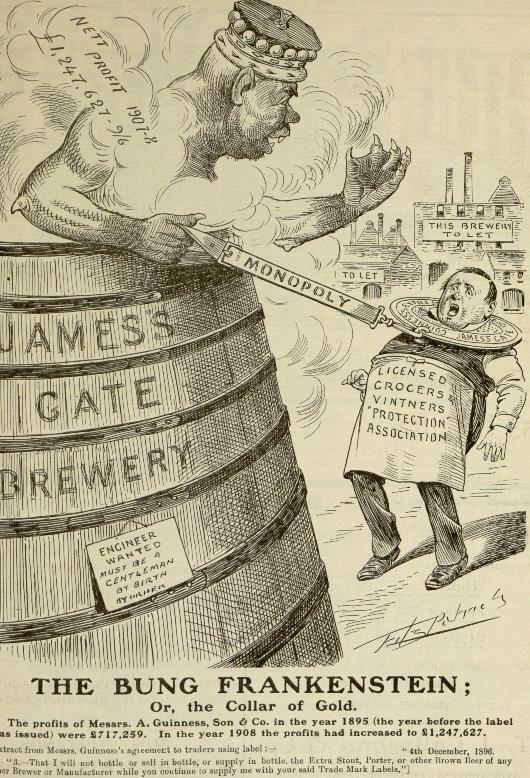 This cartoon from 1908 deals with the issue of relations between the Guinness Brewery and other brewers in the city, and relates to the manner in which Guinness would not allow their traders to use Guinness labels if they continued to supply any other porter or stout, something which led to their profits almost doubling in a period of just over ten years.